There is so much to say about Pilates that it cannot possibly be put on a single page. However, I truly believe that if a woman is going to pick a single form of exercise, Pilates should be it. It is incredibly adaptable – not only can it suit any body type and level of fitness but it can serve you well throughout your life as your body changes. 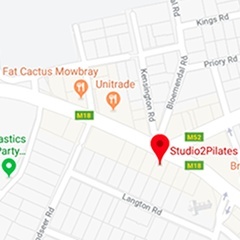 At Studio 2 Pilates, we offer mat-based and equipment Pilates classes and incorporate accessories and small apparatus such as balls, bands, rings and rollers into most classes. We offer classes to suit all levels of fitness and experience and our instructors are passionate about providing classes that are always dynamic, different and of the highest standard. 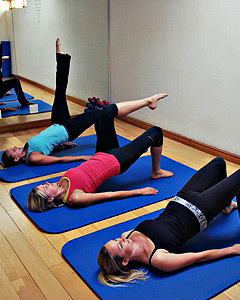 Our Pilates classes run throughout the day. Have a look at our class schedule to see which class time might suit you best. We offer different types of classes to suit different needs and preferences. For more information about the types of Pilates classes we offer, please visit our classes page. For information on our prices, please visit our prices page. You will find information about Pilates throughout this website. The FAQs and blog are great places to go if you want to get into more depth. Below you’ll find a few of the many benefits listed as well as a brief history of Pilates. Alternatively, if you’d like to find out more, please contact us! Born in Dusseldorf, Germany, this remarkable man started life as a sickly child, suffering from rickets and rheumatic fever. To overcome these ailments, perhaps inspired by the form of physical training introduced into schools in Germany, he studied human anatomy and movement and rehabilitated himself to the point where he was asked to pose for anatomical drawings. He went on to become a boxer and a circus performer in England. During World War I, he worked as a nurse in an internment hospital in Lancaster, England, where he developed exercises using the bed springs to rehabilitate his patients. 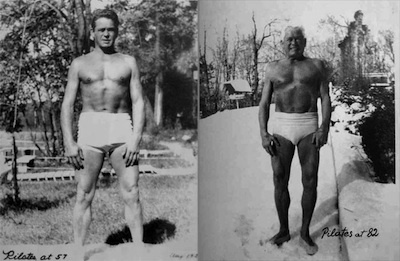 Joseph Pilates in his 50s & his 80s – Pilates clearly worked for him! After the war, he returned to Germany and continued to develop his fitness training programs with the German army. In 1926, he emmigrated to the United States. He met his future wife Clara, a former nurse, and together, they established the first Pilates studio in New York City. He attracted the attention of several major dance companies, including Martha Graham and George Balanchine, who sent many of their dancers to Pilates to rehabilitate from their injuries. He continued to develop his method throughout his lifetime. He lived to the age of 83 when he tragically died of smoke inhalation; the result of a fire in his New York studio. He was in great shape at the time – a testament to the effectiveness of his training methods, exercises and beliefs. Pilates is the thinking person’s exercise with a quality over quantity approach. Two repetitions of a movement done precisely, incorporating correct breathing are more effective than doing 20 repetitions incorrectly!